Author(s): Majid M. Heravi, Department of Chemistry, Alzahra University, Vanak, Tehran, Iran. Mehrnoush Tamimi, Hoda Yahyavi, Tayebeh Hosseinnejad. Huisgen cycloaddition reaction has been originally utilized for the synthesis of 1, 2, 3-triazoles regioisomers. In this review, its stereochemistry and also mechanistical features of Huisgen cycloaddition reaction based on the quantum chemistry are highlighted. Thermal and copper catalyzed approaches to the synthesis of 1,2,3- triazoles will also be re-visited. Finally, the synthesis of alternative region-isomer, 1,5-disubstituted-1,2,3-triazoles under ruthenium catalysis and transition metal free conditions is described. Keywords: Huisgen cycloaddition, 1, 2, 3-triazoles, quantum chemistry, copper, regioisomers, ruthenium. Affiliation:Department of Chemistry, Alzahra University, Vanak, Tehran, Iran. Keywords:Huisgen cycloaddition, 1, 2, 3-triazoles, quantum chemistry, copper, regioisomers, ruthenium. Abstract:Huisgen cycloaddition reaction has been originally utilized for the synthesis of 1, 2, 3-triazoles regioisomers. In this review, its stereochemistry and also mechanistical features of Huisgen cycloaddition reaction based on the quantum chemistry are highlighted. Thermal and copper catalyzed approaches to the synthesis of 1,2,3- triazoles will also be re-visited. 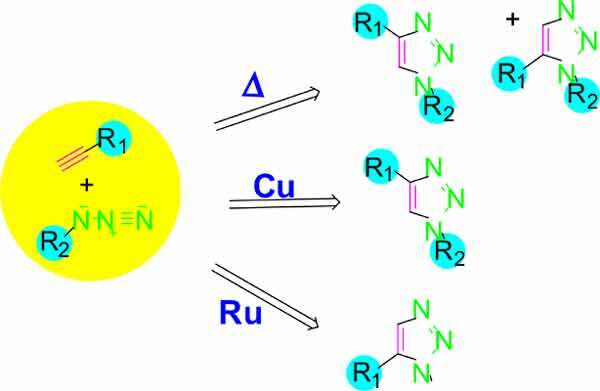 Finally, the synthesis of alternative region-isomer, 1,5-disubstituted-1,2,3-triazoles under ruthenium catalysis and transition metal free conditions is described.